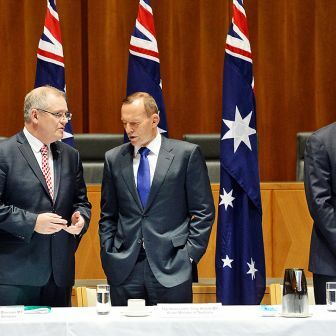 THE recent Grattan Institute report, Budget Pressures on Australian Governments, argues that the federal government and the states and territories could face a combined annual deficit of around 4 per cent of GDP by 2023, of which around 2.5 per cent of GDP would be at the federal level. 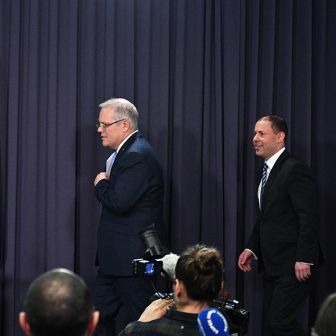 The scale of the federal government’s fiscal challenge was also a theme of the debate about the Federal Budget last month and will undoubtedly feature in the election campaign later this year. This preoccupation with middle-class welfare is partly motivated by the view that the budget gap shouldn’t be bridged by increasing taxes. In the Financial Review, Fleur Anderson suggested that “the middle class and the professions are staging a revolt as they find their growing share of the tax burden too hard to bear, after over a million people were made exempt from the tax system over the past ten years.” In that newspaper and elsewhere, commentators have pointed to the Australian Tax Office’s tax statistics for the 2010–11 financial year, which show that the top 5 per cent of income earners pay 34.1 per cent of net income tax and the top 25 per cent of income earners pay just over two-thirds of net income tax. 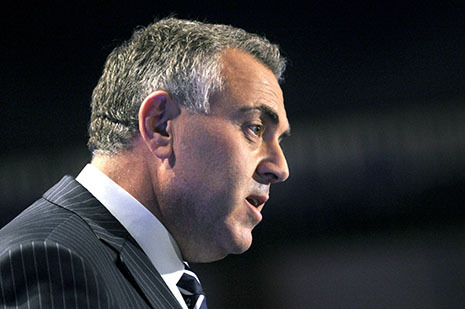 Correspondingly, about 45 per cent of Australians pay no income tax at all. Should we deal with the growing budget gap by cutting spending or increasing taxes – or by some combination of the two? Before we try to answer that question we need a clear understanding of the current distribution of welfare spending (who gets what?) and how spending is financed (who pays for it?). Are higher income groups already overburdened with taxes or are they actually benefiting too much from profligate spending? Fortunately for those interested in accurate answers to these questions, the Australian Bureau of Statistics has published studies of government benefits and taxes and their impact on household incomes since the 1980s, with the most recent results being for 2009–10. These studies provide the most comprehensive accounting of government spending and taxation in Australia, taking into account not only the impact of social security cash benefits and direct taxes but also the effects of government spending on healthcare, education and community services, and the impact of indirect taxes, such as the GST. The ATO statistics used by the Financial Review and others are certainly useful, but they only identify who pays income taxes and don’t include the GST or other indirect taxes. Nor do they tell us what benefits households receive from governments. The poorest 20 per cent of households received about $435 per week in cash benefits and received services worth about $446 per week (mainly public healthcare); they paid negligible amounts of income tax but around $105 per week in indirect taxes (excises, rates and the GST). In contrast, the richest 20 per cent of households received only $15 per week in cash benefits (or about one-thirtieth as much as the lowest income group), received $234 per week in government services (mainly education and healthcare), and paid $756 per week in income taxes and $273 per week in indirect taxes. Not surprisingly, government spending on health and education is far more important than social security for the richest households. The richest quintile received only 1.7 per cent of social security benefits, but benefited from $83 per week in education benefits, or around 14 per cent of total government education spending, and $140 per week in health benefits, or 15.5 per cent of health spending. Overall, the non-cash benefits received by the richest were worth nearly sixteen times as much as the cash benefits they received ($234 per week compared to $15 per week). Of the cash benefits received by the richest 20 per cent of households, only $1 per week came in the form of family payments, the most common target of the criticism of middle-class welfare and the main target for reduced spending in the 2013–14 Budget. Most of the social security benefits received by the richest 20 per cent were age and disability pensions, veterans’ pensions and unemployment benefits. This is not because the income-testing of these payments is lax; income tests in the social security system are based on the nuclear family, so this “leakage” to high-income households is mainly the result of aged or disabled people or the unemployed sharing a house with their parents or their children. On the tax side, the richest quintile of households paid around 58 per cent of income taxes and 30 per cent of indirect taxes, although they had 45 per cent of private income. 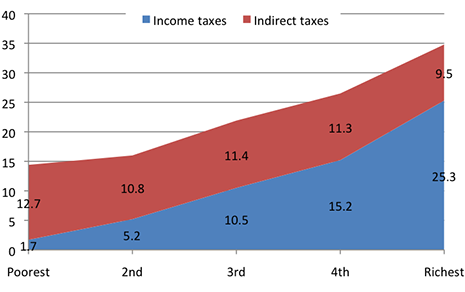 Direct and indirect taxes paid by the richest households amounted to 46.5 per cent of all taxes paid; so while indirect taxes offset some of the progressivity of income taxes, the overall tax take is still progressive, as shown in Chart 2. 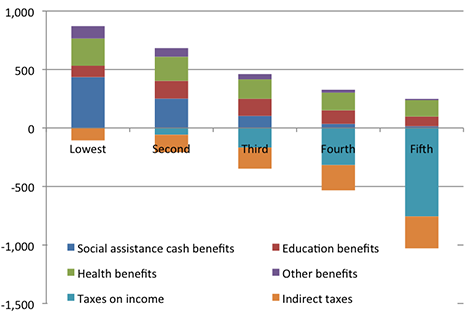 Most importantly, of course, these taxes pay for the benefits received by lower-income households. The overall scale of redistribution in Australia can be gauged from the fact that while private incomes among the richest 20 per cent were more than twenty-one times higher than the private incomes of the poorest 20 per cent, that disparity was reduced to about three-to-one, or by 86 per cent, after benefits and services were received and taxes paid. In terms of improving the incomes of the poor, social security and government services are roughly equally important, with the social security system increasing its share from 2 per cent of private income to nearly 7 per cent of gross income. Because the poorest income group pay a small fraction of 1 per cent of income taxes, their share of disposable income was increased to 8 per cent, with government services increasing this further to 11 per cent of final income. Although indirect taxes are regressive, in this case taking 12.7 per cent of the income of the poorest households compared to 9.5 per cent of the income of the richest, they did not materially alter these disparities. THESE ABS figures provide a snapshot of the distribution of benefits and taxes at a point in time, but in assessing proposals for reform it is important to keep in mind the longer-term impact and objectives of taxing and spending. Overall, the Australian welfare state performs two main functions – redistribution between rich and poor (the Robin Hood function) and insurance and consumption smoothing (the “piggy‐bank” function). In Australia we tend to focus on the idea that the welfare state should mainly be about redistribution to the poor, which is why we focus so much on concerns about middle-class welfare. But as I have argued previously, Australia actually has the lowest level of middle-class welfare in the developed world and targets its spending to the poor more than any other OECD country. As well as redistributing between rich and poor, however, Australia redistributes considerable resources to older people (as do all other developed welfare states). For example, households with a head aged seventy-five years and over have by far the lowest average private incomes, but in 2009–10 they received 43 per cent of all age pensions and 21 per cent of all health spending, and they paid less than 1 per cent of income taxes and 5 per cent of indirect taxes. In combination, this pattern of spending and taxing boosted their incomes from about one-third of the population average to three-quarters. Similarly, households with a head aged between sixty-five and seventy-four years got 46 per cent of age pensions and 16 per cent of health spending and paid 2.5 per cent of income taxes and 9 per cent of indirect taxes; this boosted their incomes from just over half the population average to just over three-quarters. • Around 3 per cent are fired or made redundant each year, and 10 per cent over four years. • Around 8 to 9 per cent experience a serious personal injury or illness each year and 26 per cent over four years. Between 15 and 17 per cent experience serious injury or illness to a close relative or family member each year and nearly 50 per cent over a four year period. Around 10 per cent experience the same each year for a close friend. • Around 1 per cent experience the death of a spouse or child each year, and 3 per cent over four years. Around 11 per cent experience the death of another close relative or family member per year, and 40 per cent over four years. • Around 3 to 4 per cent separate each year and more than 10 per cent separated from a spouse or long-term partner between 2004 and 2008. Separation or divorce is by far the most important cause of lone parenthood. Between 1 and 1.5 per cent change each year from being a couple with children to being a lone parent and 4.1 per cent over nine years. As a result of these and other risks, many Australians experience significant changes in their economic circumstances both in any given year and cumulatively over time. 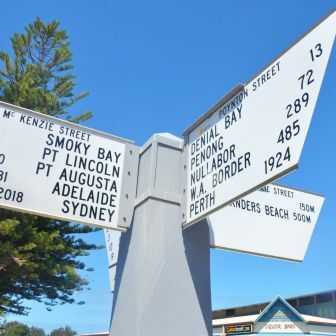 Commentators who praise Australia’s performance on measures of income mobility tend to focus on upward movement – low-income young people finishing their studies and then moving into jobs and people moving up the occupational ladder. But the HILDA report shows that in each year between 2001 and 2008 between 40 and 50 per cent of Australians experienced a drop in income and roughly 10 per cent fell more than 20 percentiles in the income distribution. Over the whole period, 44 per cent of the population moved more than 20 percentiles. Around half of those in the richest income quintile in 2001 were still in that income group in 2008, but the other half were in lower-income groups; only 30 per cent of those in the middle-income group in 2001 were in the same group in 2008, with 30 per cent being worse off and around 36 per cent being better off. THIS mobility is also important in thinking about who benefits from and who pays for the welfare state. There is a tendency to think of welfare recipients as people permanently dependent on payments – the “takers” as described above, with the corollary that other people are the “makers,” permanently “independent” of welfare. But the impact of unforeseen events and consequent changes in incomes mean that over time many people change their status as recipients of welfare payments on the one hand or as taxpayers on the other. In 2001, for instance, fully 37 per cent of working-age people received income support at some time in the year, although in 2008 – after a period of strong economic growth – this had fallen to 29.5 per cent. But 65.7 per cent of working-age Australians lived in a household where someone received welfare at some time between 2001 and 2009. In any one year in this decade between 5 and 7 per cent of working-age Australians received 90 per cent or more of their income from welfare payments (not including family payments) and fully 15 per cent of the population was in this position at some stage in the period (although only 1.2 per cent were reliant for all nine years). In other words, people of working age who are “welfare dependent” for long periods are only a tiny percentage of the population, while many highly and very highly paid individuals face substantial risks of large income drops, associated particularly with health changes but also with changes in employment and family status. 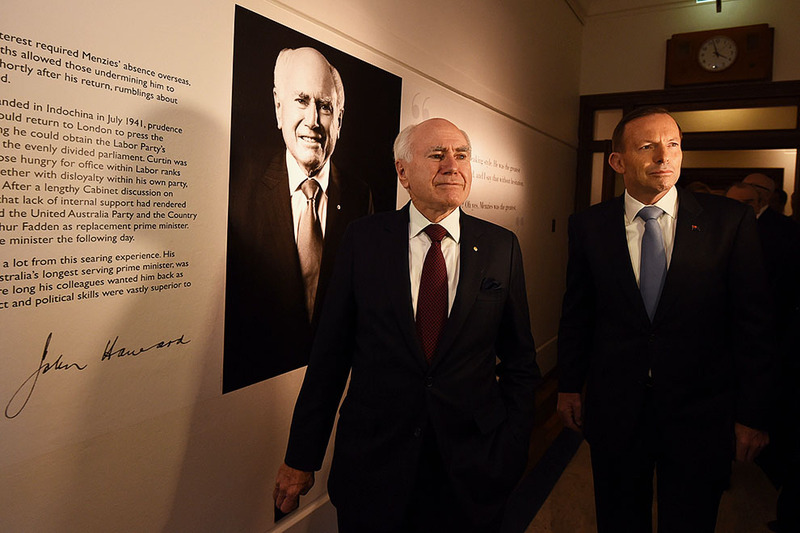 In summary, the welfare state – defined broadly to include health and education as well as social security payments – touches the lives of many more Australians than is commonly thought. Nearly everyone may be a “maker” or a “taker” at different stages in life. It is certainly important to review government spending regularly to assess whether it is meeting its objectives. But the idea that there are vast amounts of wasteful social security spending that can easily be cut back simply does not accord with the reality that the Australian benefit system is the most targeted to low-income groups of any developed country. A further tightening of this targeting will unavoidably mean higher withdrawal rates for benefits and higher effective marginal tax rates over the range of incomes where benefits are withdrawn. For large savings to be achieved it is necessary either to cut social security spending well down the income distribution and shift the consequences of adverse risks and contingencies onto households, or cut spending in the politically popular areas of health and education. It is also worth noting that there is an inconsistency in some of the arguments of those who favour cutting spending but not increasing taxes. On the one hand, there are those who argue that we should not increase taxes on higher-income groups since they already pay a disproportionate share of the tax burden; on the other hand there are those (including sometimes the same people) who argue that we should cut government benefits going to higher-income groups, when cutting benefits can obviously have a similar effect on disposable income as increasing taxes.